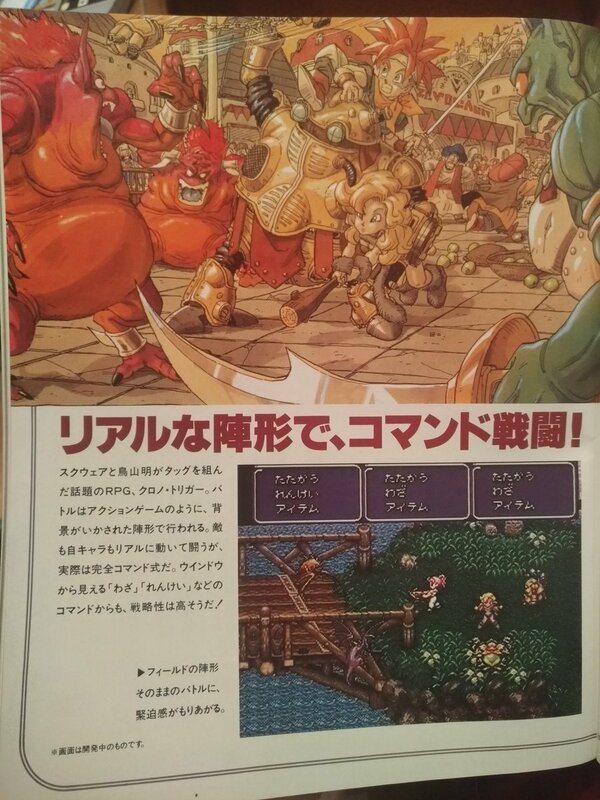 Sorry if I'm late tot he party, but this just came up on Twitter: Next up is Weekly Famitsu Sept. 23, 1994. Hate using the "beta" and "alpha" verbiage of yore, but it pretty effectively communicates that what we're seeing here is the old tileset for 1000 A.D. There's also a different Zenan Bridge look going on as well. Will get these in the encyclopedia in the next update. If anyone knows OKD, we would murder to get better scans of those pages. I love those little windmills. And are those waterfalls? And another plane too. What catches more my attention is that lower-right picture in the first image. Seems like a blend of 1000AD and 2300AD interiors. Considering it shows Lucca fixing/maintaining Robo as Crono, Marle, and Frog watch, it makes me curious about the context. Early version of Lucca's house? I could definiitely call it an early work, the two top pictures make the world travel look squarish, i know you can only move in 4 directions but it doesnt feel that way, its open, while the square paths look older, more ff1 era. The battle commands are a little wider in this version, making it so you can't see character names or HP/MP when everyone is ready. I'm curious how this would have displayed when you weren't ready. That future location looks different than any location I recognize in game. I wonder what house the Epoch is flying over in that screenshot. Maybe it's the location Robo was discovered, where the future was planned to be slightly less bleak/destroyed (or, at least, the interiors were nicer looking). Much of the art, especially the world map, gives such a Final Fantasy feel, huh? If it was the future, then I wonder about Frog's prescence there. Perhaps he would join earlier. Maybe it's part of a cutscene somewhen else. I don't think the text next to the picture gives context. From what little I can understand, it seems to talk about "party of 3 members", and lists a few of the characters. I see the words Girlfriend (or just Girl Friend? 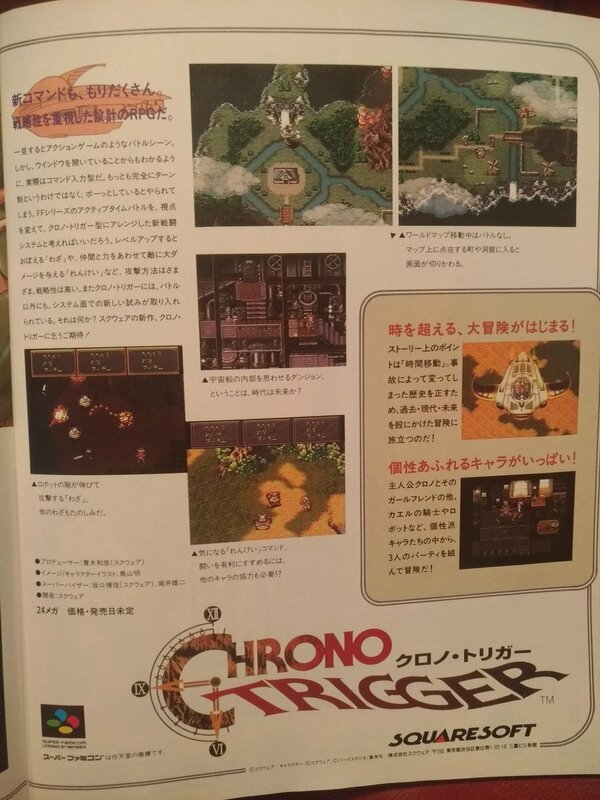 Hard to tell), Frog, and Robot there, alongside Crono's name. It's not placeholder. The top name is Tatakau, which means more or less "Battle" of "Fight". It's the standard Attack command. The bottom name is Item, also self-explanatoru. Now, for the middle names, the box of the left has Renkei, which means like "Cooperation" or "Link". While the other two are "Waza", which is "Skill" or "Ability". Respectively, they're the Combo and Tech commands. So no, it all points that was finished. In fact, form the context of the text in the first image, it sounds like it's explaining the Renkei commands. As in, the Double/Tripple techs. Perhaps the only thing we can question is why only one of the Tech's turns into Combo if, well, Double/Tripple Techs would imply at least one other character would have Renkei, not Waza. Neat. I admit I thought the sprite of Frog was background art. Whoops. I am encouraged to learn intermediate Japanese (and certain other languages) if only to understand exclusive content like this. I have my kanas... so I am already 0.0001% of the way. We've seen a variation on that early Zenan Bridge screenshot before, in low quality, in one of the Next Gate images. 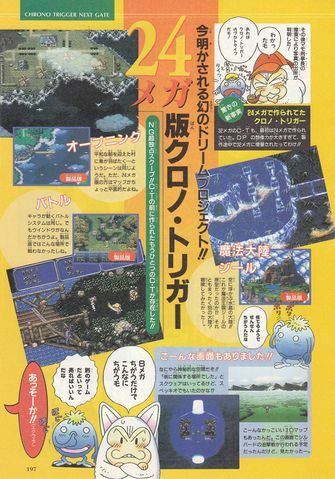 The dome screenshot is the same one in the Brazilian magazine scan. Now if there were only doujins to find. Or a proto type cartridge like the space world GS demo. I look at the bottom right picture with the mountains in the background, was this an early theory of using like mode 7 to walk around the world? a precursor to a 3d world view from the 1st person sort of? I was looking through a Twitter feed (Chronomoogle's) and found a retweet to one with lots of V-Jump scans. Mostly pre-release/"beta"/proto and final stuff, but there are still some things we haven't seen before. I don't want to hijack this thread too much, so this is just the October 1994 stuff (not necessarily new). The "ice" tileset seen in the "Next Gate 8" page I posted earlier. Crono and Marle on a strange landscape. The "robot village", also seen in "Next Gate". Not sure if it's just my weird brain, but the pic with Marle on top and the arrows pointing to lucca and ayla, it looks like some strange Pokemon reference where Marle could evolve using earth or fire stones into either Ayla or Lucca.